Leading marketing companies are leveraging marketing technology and customer analytics, so that they can play a leadership role in improving customer experience management. Improving customer experience touches many parts of an organization and marketing has a critical role to play. Integrate & Act on Customer Context: Understand the context of customer interaction and have the ability to respond accordingly. Systematically Use Customer Insights: Marketing leaders use technology to develop customer insights and act on them in a consistent basis. Understand the Broader View of Customer Experience: Successful digital marketers recognize the basis and full scope of their customer engagement, so use analytics to drive your actions and create customer relationships that grow and strengthen over time. The most successful businesses are able to focus on customer engagement by seamlessly integrating across all channels. Utilizing tightly integrated cross-channel marketing technology will provide the foundation to improve customer experience management. Customer insight becomes the catalyst for managing and taking action to improve customer experience. Even for marketing leaders integration challenges remain, like integrating across social and mobile channels. The reward for companies that are able to address these challenges is a demonstrablly higher financial return. How well is my business converting customer interactions? What are the obstacles to purchases and detractors from customer experience? Can we identify and target customers that have abandoned online transactions? Do I have customer analytics that provide a view across the customer lifecycle? In the end, the highest performing businesses have a clear view of their end goal. To them, marketing is more than a series of individual sales. It’s an influence, and a responsibility that goes beyond the sales cycle. With cross-channel marketing technology, it brings all your channels and interactions together to deliver a superior, end-to-end customer experience. Digital marketing done effectively will translate into a better experience for the customer, and increase revenue for your business. 1The State of Marketing 2013, IBM's Global Survey of Marketers, 2013. You Know What’s Happening On Your Website, But Do You Know Why? What website component are they struggling with? Is it the navigation? Why are they not clicking on your CTAs and filling out the forms? Why didn’t they complete the transaction and abandon the cart? Was it simply customer error? Or a technical failure? So how do we answer the why question and get to the root causes? What problems could have been avoided if you had visibility into their online experiences? As part of the IBM ExperienceOne portfolio, the IBM Tealeaf CX platform is a solution that records the behavior of your website visitors, giving you critical insight into their online experience in real-time. IBM Tealeaf gives you that qualitative data. In other words, it tells you why your customer is doing what they’re doing, instead of just what they’re doing. By performing a qualitative analysis of each customer interaction, IBM Tealeaf gives you the unparalleled visibility and insight into the answers you need to provide your customers with a positive online experience. You’re able to track your customers in real-time, getting into their virtual minds, and determine their reasons for struggle or abandonment. Being able to see the way your website works through the eyes of your visitors regardless of whether they’re using a desktop or mobile device. Giving you a 360 degree perspective of your customer during the visitor session. Enhancing your call center service levels by responding seamlessly with immediate customer session analysis. Resolving problems and roadblocks that are hindering customer satisfaction and revenue. Ability to alert to, create and diagnose problems encountered by real users. Capturing website traffic without interfering with site performance. Reliable architecture that scales to fit true enterprise class websites. Because you can gain real insight into what customers do and why they do it, IBM Tealeaf provides a set of compelling business benefits and a quick ROI. Increasing customer satisfaction, retention and loyalty. Improving customer conversion rates and overall revenue. Identifying potential patterns of fraudulent activity. Prioritizing system and website design changes. To learn more about the benefits and capabilities of the IBM Tealeaf CX platform, please visit our IBM Tealeaf page and our IBM Tealeaf Resources page. Please also share this blog using the social media icons above and subscribe to the Pereion blog and Marketing Analytics LinkedIn showcase page below. Marketing automation provides the tools that make it possible for IT service providers, or managed service providers, to build pipeline and grow their businesses. When we refer to marketing automation we’re talking about applying techology that allows you to more fully understand and interact, with potential buyers throughout the sales lifecycle. Marketing automation provides the resources to identify, nurture, and close these prospects in a manner that is valuable to them. The key feature of any marketing automation tool is to focus on the relevance of communications: Deliver personalized messages to your targeted audience. Act-On & HubSpot are two Pereion partners that provide marketing automation services. Act-On is a cloud-based marketing automation platform with simple tools that track and measure any of your complex programs. They provide you with straight-forward approaches that analyze your web traffic, nurture your leads, integrate with your CRM, and allow you to easily manage your campaigns. HubSpot’s marketing automation also feeds your sales pipeline, offering marketing analytics to optimize all your programs. They offer automated workflows to set up your marketing automation process so you’re able to engage and nurture your contacts with targeted, personalized emails at the most relevant time. These workflows are based on your buyer persona and goals. HubSpot provides the tools for you to attract, convert, track, categorize and profile your leads according to their characteristics and behavior. Are you using a marketing automation platform? How has it benefited your company? If you’d like to discuss the specific marketing automation objectives for your business, please use the comment section below or contact Steve Perry directly at slperry@pereion.com. Please also feel free to share this blog using the social media icons above. You can subscribe to the Pereion blog below, as well, to continue receiving information on how IT solution providers utilize marketing automation, and other inbound marketing strategies. 1Leveraging CRM Marketing Automation with Digital Marketing Tools, Digital Warriors, 2014. 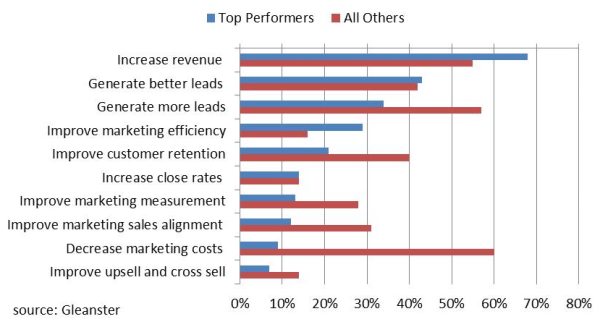 2 The Data You Need to Make a Compelling Case for Inbound Marketing, HubSpot, 2014. 3All The Marketing Statistics You Need, HubSpot, 2014. 4100 Stats, Charts, and Graphs to Get Inbound Marketing Buy-In, HubSpot, 2014. 5Using Act-On, NuGrowth Sees 3X Increase in Leads, Act-On, 2014. 6Australian Rezdy Software Uses Marketing Automation to Increase Leads by 500%, HubSpot, 2014.